Licia Politis is an award-winning paper filigree artist I've had the pleasure of getting to know via our involvement in the North American Quilling Guild. Even though she lives on the other side of the world in Australia and we've not yet had the chance to meet in person, hopefully someday we will. Meanwhile, we enjoy sharing ideas with one another, as well as pictures of whatever it is we're working on at the moment. Lately both of us have been making jewelry. 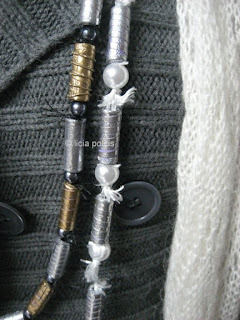 I think these strings of paper beads that Licia creates are quite unusual. 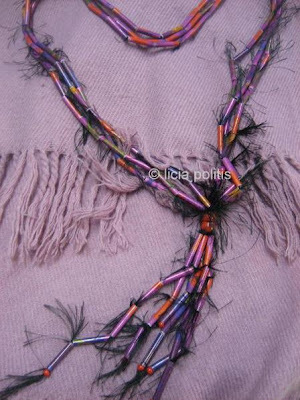 I especially love how they're strung on eyelash yarn - it adds to their funkiness, don't you think? Licia's silver and gold embossed beads were featured recently in the Australian magazine, Creative Paper [edit: no longer published], which is always an enjoyable read. It contains lots of fresh paper crafting ideas that use many of the same products/papers available in the U.S., plus the photography is beautiful.